The Pacific Dawn called in with Limits of Yellowfin (150) and 17 Bluefin Tuna for their 2 day trip with 15 anglers. The Liberty finished with 144 Yeloowfin Tuna and 73 Skipjack for their Fullday trip. The Pegasus has LIMITS of Yellowfin Tuna on day 1 of their 2 day charter. 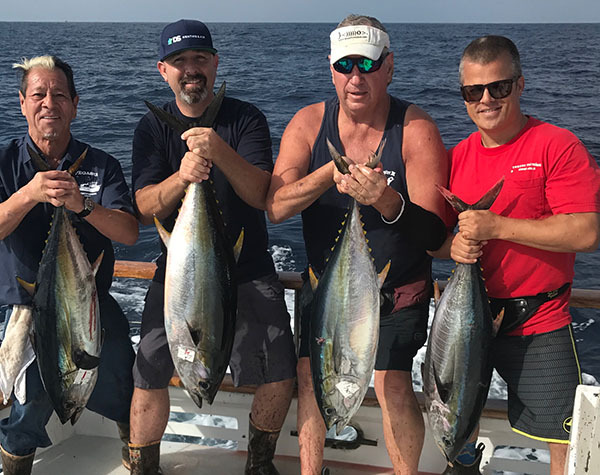 The Fortune called in with LIMITS of Yellowfin Tuna (160) for both days of their 2 day charter. The Pacific Queen returned this AM 319 Yellowfin Tuna, 36 Yellowtail (18-30#), and 1 Dorado on their 3 day trip. The Condor returned this AM with 51 Yellowfin Tuna, 3 Dorado, 2 Yellowtail, and 35 Skip Jack on their 1.5 day trip. The Dolphin AM trip had 9 Sandbass, 27 Bonito, and 81 Rockfish for 22 anglers. The Dolphin Pm trip had 2 Yellowtail, 9 Sandbass, 26 Bonito, and 9 Rockfish for 15 anglers.